Rob Manuel suggested that I attempt to recreate the fun of 1980s type-in programs, those code listings which were published in computer magazines for users to manually enter before they could play an inevitably disappointing game. 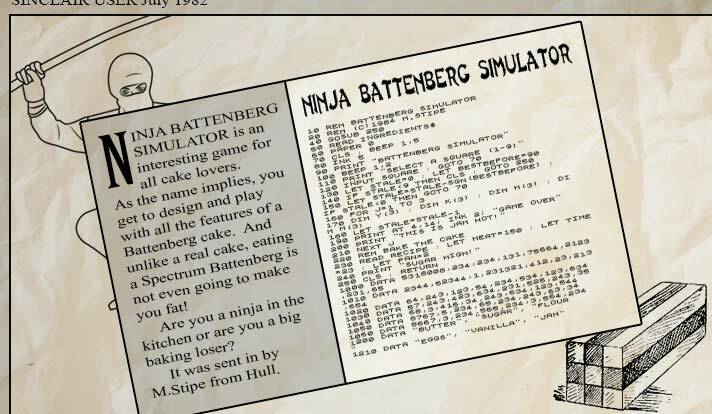 In this case, we'll be typing in Ninja Battenberg Simulator from Sinclair User. Simply type any keys as fast as you can and the listing will appear on the Spectrum 48k emulator below. However, do not press the same key more than once in a row as that will cause you to make a typo. Each typo you make increases the chance of the game not loading when we run it at the end. If you are too slow and run out of time before the listing has been fully typed in, then an unfortunate event will occur and it's game over. Can you type fast enough to play the game?